 We define the Nano/Micro Electro Mechanical System (N/MEMS) as a miniaturized electromechanical system, in which small-sized mechanical, thermofluidic, optoradiative and biochemical devices and structures are combined with electrical devices to achieve improved performance or new functions in multi-modal nano/micro regimes. The driving forces and major advantages of the miniaturization (Fig.1) include the improvement of the 3P (Price, Performance, and Power consumption) of electromechanical systems. 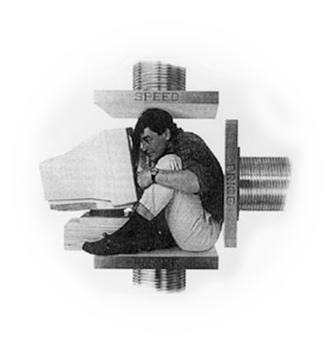 Fig.1 Driving forces for miniaturization. [Analog Devices] Fig.2 Nano/Micro transduction among multi-modal realms. From the functional point of view, N/MEMS performs nano/micro-scale transduction (Fig.2) among mechanical, electrical, optoradiative, thermofluidic and biochemical realms. We consider the media or matters of the nano/micro transduction as the carriers containing mechanical, electrical, optoradiative, thermofluidic or biochemical information. The concept of the multi-modal media has been extracted from the historical review (Table 1) of the technology revolutions in the past, present and future centuries. In Table 1 we classify the technology eras in the view of energy utilization. Before the industrial revolution, Human utilized natural energy in unmodified forms (i.e. as it was). Human simply used the thermal energy of fire for cooking and heating, and the radiative energy for lighting, respectively. The industrial revolution era, however, is featured by the invention of the methods to modify or convert the form of energy for specific applications. Steam engine converts the thermal energy of fire into that of steam, eventually obtaining the mechanical energy to move things. The electronics revolution era is characterized by the use of electrical energy as information carrier, while the electrical energy in the industrial revolution era had been used as a power carrier. In the future technology era, the energy of non-electrical modalities, including mechanical, optoradiative, thermofluidic, and biochemical modalities, will be utilized as information carriers.